February 2018 – Narooma Rotary Club Inc.
Well, the heavens opened early on Sunday morning with steady rain most of the day, so another cancelled market for us, the second in a row. It’s frustrating for Chris, John and Ang who spend so much time getting the markets organised only to see the rain ruin the day. Hopefully the weather for our March market will be fine and sunny with lots of stallholders and plenty of customers. 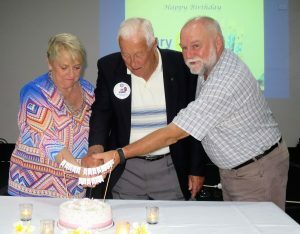 Three of our Past Rotary District Governors cut the cake to celebrate Rotary International’s 113th birthday – Maureen Manning, left, Joe Scorer and Phil Armstrong. Last Wednesday, I along with six other members of the Club, attended a combined meeting at Moruya to mark Rotary’s birthday and to hand out cheques to the four surf clubs in the shire. It was a great night, especially as the three NYSF students sponsored by the three Eurobodalla Rotary Clubs also gave a presentation. Laurelle has more information elsewhere. As mentioned last week, there is a change of plan for this week’s meeting. Unfortunately, the High School was not able to host us this week so instead this Thursday we will have a Club Assembly and normal meeting at the Golf Club. At the Assembly we will discuss the feasibility of conducting the Renewable Energy Expo again this year. The Expo Committee met a couple of weeks ago to discuss options for 2018. Discussion focussed on the need to have more members nominate for the Expo Committee; many on the past committee indicated that they would not be able to help around that time this year because of other commitments. The bottom line is that if we are to run the Expo again this year we need some new faces on the team. Our meeting at Narooma High will now be on 8 March. I am assuming that members who indicated they will attend the High School on 1 March will still be able to attend on the 8th. Please let me know urgently if this is not the case. A reminder our District Conference is at Mittagong 24-25 March. I know this clashes with our Market day; however, it would be great if some members could attend the Conference. For more details click here. At the presentation of donations from the Rotary Moruya Race Day were Surf Club representatives Colin Knight (Batemans Bay), front left, Alan Veness (Broulee) and Ava Weymans (Moruya), Moruya Jockey Club President Peter Atkinson, Batemans Bay Rotary President Maureen Manning, and Graeme Spicer (Narooma Surf Club); Race Day Committee chairman David Ashford, back left, Rotary Presidents Mike Dent (Moruya) and Bob Aston (Narooma). 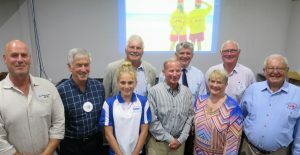 As Bob said, seven of us joined Moruya and Batemans Bay Rotarians in Moruya last Wednesday to celebrate the 113th birthday of Rotary International and to make donations to the Shire’s four Surf Life Saving Clubs. The donations were the proceeds of the Rotary Christmas Race Day on 24 December. David paid tribute to Moruya Jockey Club, to the ongoing enthusiasm and hard work of the Race Day committee, to the willing Rotarians, partners and friends, and to volunteers from the surf clubs. He also thanked the raffle (Mitre 10 Moruya, Travel Team, Moruya Jockey Club and Bunnings) and race sponsors. He said it is not possible to hold these events without everyone’s help and support. Three Eurobodalla students selected for the National Youth Science Forum (NYSF) in Brisbane in January spoke at the combined Rotary meeting last week about their ‘life-changing’ experiences at this two-week residential programme. NYSF is designed to encourage young people in their passion for science. 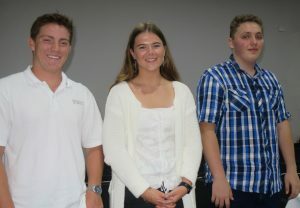 Nicholas Goddard, Chelsea Rowley and Matthew Henry all from Moruya High – spoke glowingly of their recent NYSF experience. To get to NYSF, they were first vetted by a panel from the three local Rotary Clubs and then by a District Board. Competition was strong. 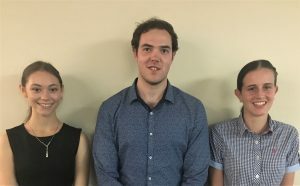 The three students –Nicholas Goddard, Chelsea Rowley and Matthew Henry, all from Moruya High – said NYSF’s visits, practical exercises, interactive teaching and social bonding were exceptional and have helped guide them towards future careers. NYSF is expensive, but regarded as well worth it. This year the basic cost increased to $3,100 per student. The three Eurobodalla clubs had agreed to share the costs; however, Moruya President Mike Dent gained a Federal Government grant of $4,500 to offset the cost, and Matthew Henry won a $1,000 NYSF Equity Scholarship to support his participation. The other two students each contributed $400, leaving the three clubs to pay $1,000 each. As the Moruya Rotary bulletin put it this week, ‘NYSF is fertile ground for growing our scientists, technology buffs and engineers, the leaders of the future in fields which will shape all our futures’. Rotarians helped establish NYSF (then known as the National Science Summer School) 35 years ago, and continue to play a key role. Today, Rotary clubs around Australia continue to play a key role in supporting NYSF by conducting selections for the NYSF Year 12 Programme. The world is on the brink of eradicating polio, a vaccine-preventable disease that once paralysed hundreds of thousands of children each year. Significant strides have been made but it continues to be a threat in hard-to-reach areas and conflict zones. As long as one child has polio, all children are at risk, which underscores the need for continued funding and political commitment to eradication. Last year there were 22 confirmed cases of polio in the world; this year only three to date. Rotary is giving $53.5m this year to support immunisation and surveillance activities led by the Global Polio Eradication Initiative (GPEI). More than half the funds will support efforts to end polio in Afghanistan and Pakistan where polio remains endemic. Further funding will support efforts to keep 10 vulnerable countries polio-free (The Democratic Republic of Congo, Cameroon, Central African Republic, Chad, Ethiopia, Iraq, Niger, Somalia, South Sudan, and Syria), research by the World Health Organization (WHO), and technical assistance in West and Central Africa. Rotary has committed to raising $150m over the next three years which will be matched 2-to-1 by the Bill & Melinda Gates Foundation, yielding $450 million for polio eradication activities, including immunisation and surveillance. Rotary started its polio eradication programme PolioPlus in 1985; in 1988 it became a partner in the GPEI with WHO, UNICEF, and the US Centers for Disease Control and Prevention. The Bill & Melinda Gates Foundation later became a partner. In that time, the incidence of polio has plummeted by more than 99.9% from about 350,000 cases in 1988, protecting more than 2.5 billion children in 122 countries from polio. The letter W, in English, is called double U. Shouldn’t it be called double V? Rita Wagner our guest speaker at last week’s meeting gave a fascinating presentation on her life as an artist and writer. What made it even more interesting was the fact that her career path came about because of a horrific car accident that left her unable to continue to work as an executive with a hotel chain. I guess the message was clear – every cloud has a silver lining. It was also pleasing to see many guests at the meeting, thanks to Ang. Please remember that guests are always welcome at our meetings – it is a good way of highlighting Rotary and its work. When inviting guests, please make sure you tell them about Rotary and encourage them to consider becoming part of our small but vital Club. In this week’s edition of Rotary Weekly there is a wonderful story about Jimmy Carter and his vision for peace. I strongly encourage all members to have a read https://www.rotary.org/en/jimmy-carter-says-peace-must-be-fought. This week: A reminder there is no meeting this Thursday. Instead, we’re off to Moruya Golf Club on Wednesday night (6.30 for 7pm) for a combined meeting with Moruya and Batemans Bay Clubs. It promises to be a big night. This meeting will distribute the $12,000 raised at the Rotary Race Day on 24 December to the Shire’s four surf clubs including Narooma’s. At this meeting, Chelsea Rowley will also talk about her experience at the last National Youth Science Forum. The week after next – Thursday 8 March: We will be at Narooma High School. 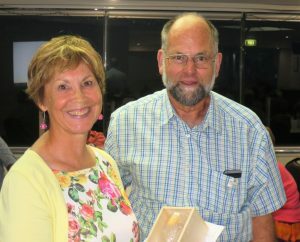 Last week’s guest speaker Rita Wagner was thanked by John Doyle. Rita Wagner’s talk last week was truly inspirational. What resilience, determination and true grit to recover from near death after a horrific car accident, stay optimistic and persevere over the many months as surgeons rebuilt her smashed body, and then establish a whole new career as an artist and author. Hence the term she used of being an ‘accidental artist’. She discovered art when in search of something to stimulate her mind while spending over a year in a wheelchair, starting with interior design and moving on from there leaps at a time. She described herself as a mixed media artist influenced strongly by Japanese art. She has also written and illustrated several light-hearted books – Menopause Makes Mummy Mental! and two children’s books. Rita now lives at Mystery Bay, previously Canberra. 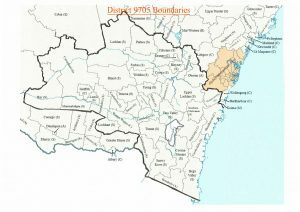 Map showing the boundaries of the new District 9705.
and that the new positions of Area Governors will replace the current system of Assistant Governors; they will also have extended roles within their areas. Still at draft stage is what clubs will be in which areas. At the moment, the proposal is for Narooma to be in Area 6, along with 14 other clubs in the Eurobodalla, Shoalhaven, Bega Valley and Wingecarribee (Bowral-Mittagong, Moss Vale and Berrima District) Shires. Area 6 has the largest number of clubs. DG Steve is keen to hear from anyone who has any thoughts on which clubs should be in particular groupings, as well as any other thoughts you may have about the new District. He would like to hear those thoughts fairly soon. Obama, Clinton and Trump are standing at the throne of Heaven. God sees Obama’s essential goodness and offers him a seat to his left. God is greatly moved and offers her a seat to his right. David Ashford from Batemans Bay Rotary has finalised funds raised at the Eurobodalla Rotary Clubs’ Christmas Race Day. In all, $12,000 was raised. A great effort. The funds will be divided between the four surf clubs in the Shire; this means Narooma Surf Club will collect $3,000 to help them purchase much needed resources. The funds will be presented at a combined Rotary Dinner at Moruya on 21 February. It would be great to have a strong turn out from our Club at the dinner – see a separate email for more information. At our Youth Night last week, Tahlia Arnold, left, 2015 Tertiary Scholar Carl McEvoy and 2018 Tertiary Scholar Alicia Bate. 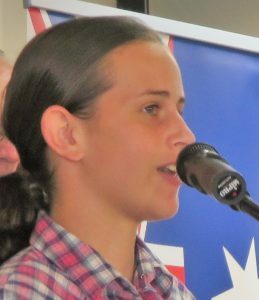 Last Thursday we held our annual Youth Night where we introduced Alicia Bate our 2018 Narooma Rotary Scholar. Alicia will be having a gap year this year before commencing her studies in Animal Science at Charles Sturt University. Alicia hopes to transfer to Vet Science if her marks are up to scratch. Whilst on her gap year, Alicia intends to travel to Texas to study animal husbandry. Alicia’s mum, Sharon also came along to the meeting. We also welcomed Tahlia Arnold to our meeting. Tahlia was interviewed for our Rotary Scholarship last year. The panel was very impressed with her desire to do well at university and decided to award her a one-off scholarship for 2018. Tahlia intends to study Psychology at the University of Wollongong. Tahlia’s mum, Michelle also attended the meeting. Carl McEvoy our 2015 Scholar was also present. Carl has just about completed his degree and has developed a strong interest in film making. He is currently looking for jobs and hopes to get an internship with the ABC. Participate in Clean Up Australia on Sunday 4 March – about six volunteers are needs to help clean up around Mill Bay and the Board Walk to the Apex Park boat ramp. Donate $500 to the Surf Club in recognition of their assistance with the Duck Race. Donate $500 to Bermagui CRABS (Cancer Research Advocate Bikers) in recognition of their assistance with the Duck Race – we borrow their ducks. Form a 60th anniversary committee consisting of Bob Aston, Rod Walker, Sandra Doyle and Laurelle Pacey. This week we welcome well-known mixed media artist and author Rita Wagner as our guest speaker. Rita lives in Mystery Bay. Her entertaining books include ‘Menopause Makes Mummy Mental’. It should be a fun night so please invite partners and friends along. 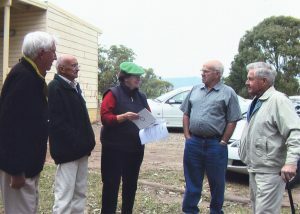 In front of Narooma Scout Hall during filming for our 2008 50th Anniversary film were Club members George Barker, left, Neville Gough and Laurelle Pacey (film director for a day! ), and former Club members Norm Hoyer and Ron Constable. Photo courtesy Trish Rose. Good news in Narooma News online that Narooma Scouts will soon start up again after a break of a number of years. Narooma Scout Hall on Taylor Lane, behind Bill Smyth Oval, was our Club’s first major project; it was built by our members in 1959/1960 re-using timber from renovations to Hyland’s Hotel. Narooma has not had a Scout troop for several years so the Hall has been neglected and looks somewhat sad with a fair amount of graffiti. The new Scout leader Ross Tornabene asked parents and children aged between 10 and 15 to come along for a free ‘Try Scouting’ night on Wednesday this week, so hopefully he gets a good response. Mr Tornabene has a wealth of Scouting experience, most recently with the combined Moruya/Batemans Bay troop; for the last two years has been a Venturer Scout leader working with youngsters 14-18 years of age. He lives in Narooma so jumped at the chance to be a Scout leader here. He was also a member of the Volunteer Rescue Association back in the days when Neville Gough was leader. Organisation for the Busking Festival on Saturday 26 May is well underway. Festival coordinator Sandra Doyle reports Chris O’Brien has done an excellent job with almost all the Prize Sponsors filled ($8,000 worth) and many of the Busker Spots as well. We are also using NATA Oval as a site for some of our remote businesses to host a busker. Registration forms have been sent to all schools up and down the coast and to all buskers on the Australian National Busking Championship database. Already some buskers have registered. All Service Clubs have been invited to again assist and all emergency services have been alerted to the date. A tourist was walking through San Francisco’s Chinatown enjoying the artistry of the Chinese shops and signs. Then he saw a sign: ‘Moishe Plotnik’s Laundry’. He was intrigued. ‘It me, me him!’ replied the old man. Well it was back into the swing with our first dinner meeting for 2018. To start the year off Laurelle took us on a tour along the Mill Bay Boardwalk before we arrived at the Golf Club. 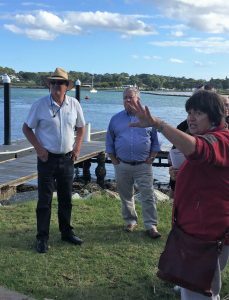 Laurelle provided us with an informative talk about Narooma and its sawmilling, maritime, tourist and Aboriginal past. Thank you Laurelle for an excellent presentation. This Thursday we start with a Board meeting at 5:00pm followed by our Youth night. We will meet our 2018 Scholar Alicia Bate as well as Tahlia Arnold. The Board has agreed to provide Tahlia with a one-off scholarship for 2018 only. Don’t forget that the District Conference will be held 24-25 March at Mittagong. Speakers include the former Governor General Michael Jeffrey and Professor of Child and Adolescent Psychiatry in the School of Medicine at the University of Adelaide Michael Sawyer. If you want to find out more about the conference click here. It would be great to have a good representation from our Club at the conference. I will finish uni at the end of this year; however I’ve applied for an internship at both the ABC and Channel 7 in their television department. I’m very likely to get it with the ABC as they are in partnership with UTS. It directly ties to my degree and I will hopefully have an interview by the time I get back to Sydney. The internship lasts eight weeks and there is a likelihood of an offer to stay on at the end of it. I would also like to stay on at university. I have been chatting with UTS Careers and a few of my tutors and would be interested in staying on and becoming a tutor. This would add an additional two years to my course, done part time. I also have a film script in an online ‘prestigious’ script review company called The Blacklist, that marks and reviews film scripts. The scripts are compiled and marked by people in the industry then returned to you with notes and ways to market the script for sale. If your script is good it is passed on to agents. At the end of the year, the best film scripts are compiled into a list and released on ‘The Blacklist’. Over 300 Black List screenplays have been made as feature films. Those films have earned over $26 billion in worldwide box office and have been nominated for 264 Academy Awards. So it’s a good thing to be a part of. So there are a few things going on; trying to chip away at the Australian film industry, remaining hopeful, and most of all really enjoying myself. Narooma’s day at RYDA (Rotary Youth Driver Awareness) is Monday 26 March at Moruya Racecourse, the week before Easter. Our Youth Director Lynda needs two volunteers from the Club to host about 50 students from Narooma High for the day. Lynda says it’s a fascinating day with presentations from local police officers, road accident survivors or family and other presenters. ‘Given the terrible spate of road crashes over the holiday period, this program I think is one of the most valuable for all Year 11 students at our local schools,’ she said. If you can volunteer for the day please contact Lynda. February is Rotary International’s peace and conflict prevention / resolution month. It is very appropriate then that the Rotary Club of Canberra Burley Griffin’s Peace Bell project will be launched at 10.30am on 23 February in the Nara Peace Park in Flynn Drive, Yarralumla ACT. Everyone is invited. The Rotary Club of Canberra Burley Griffin partnered with the World Peace Bell Association (WPBA) to raise funds and work towards placing the 23rd World Peace Bell in Canberra. Funds were raised to erect an architect designed pavilion to house the bell on the foreshores of Lake Burley Griffin. The pavilion was designed by University of Canberra architect student Lauren Kasparek and her father Fred, a local architect. The design is based on a Japanese Fan and is made from core ten steel and RHJ girders. ‘I’ve never had knee surgery done on any other part of my body.’ Winston Bennett, University of Kentucky basketball forward. ‘Your food stamps will be stopped effective March 1992 because we received notice you passed away. May God bless you. You should reapply if there is any change in your circumstances.’ Department of Social Services, Greenville, South Carolina.